It was not too long ago that men’s fashion included tons of color, and guys truly had fun with their clothes. Most fashion experts say that it was a direct response to the economic downfall; people had drab lives, so they wanted to control what they wore, and furthermore, wanted to lift their spirits. Men sported brightly coloured chino pants, and they were also playful with their socks. That was fun, but it is fizzling out. 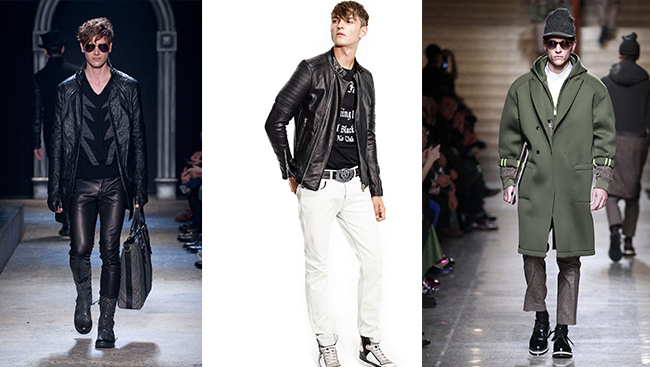 For the winter of 2014, through the cold months of the beginning of 2015, men’s fashion takes a darker turn. People are slowly rebuilding their lives; they had their fun, and are getting back to business … and also back to basics. Chains, darker tones, and trench coats are coming our way. We are going to see minimalistic measures taken in the world of fashion. Fashion is bold, and fashion is expressive. If you have a bit of a vanilla personality, look out for the Moto jacket. One finely-constructed piece in black is made by Diesel. It has a lean look, and is great to sport on holidays – or even to throw in an overnight bag when you’re off to hit the powdery slopes. Let’s discuss accessories and jewellery: It is time to part ways with multiple beaded bracelets and Kabballah-esque necklaces; chains are in this season. Large, small, brightly-coloured, or dark chains (especially with locks) are popping-up in many cities. They are predominately being donned as necklaces on most men. Another trend to keep an eye out for is metallic cameras. This one sounds slightly off base, but it’s true. Men are wearing refurbished cameras as jewellery. Let’s move on to some less outlandish sightings, shall we? Just because men’s fashion is not as playful as it used to be, it does not mean the fellas are taking their clothing too seriously. Men of all shapes and sizes are sporting dark, tightly-buttoned collared shirts, and pairing them with dark blue or black denim jeans. This season, we see men allowing their clothes to be an artistic canvas; they’re letting people see their personality, and are generally dressing these looks up with a smooth do fresh out of a 1960s flick, with some jewellery thrown in here or there. Along with the canvassing look, comes a re-introduction of skirts. These so-called skirts are trending quite well in other countries, such as Scotland and the UK, and have finally reached our shores … again. Yes, skirts were becoming popular in our culture back in 2012-13, but took a brief hiatus. These long, flowing pieces of fabric come in dark colors, but we are seeing more patterns here. Stripes, angles, and boxes are some patterns to look out for. Skirts can be paired with a plain white or gray button down shirt. Make sure the shirt itself is not patterned, and is loose-fitting, as you want the skirt to be the main attraction of such a bold outfit. If you are not so bold, and do not feel that a patterned skirt or a homage to the 1990s cult classic, The Matrix is really for you, don’t fret! Let us move on to footwear, then. Men’s footwear this winter really says “goodbye” to the dark browns and blues of the past. Boots are very popular, especially the combat boot. Think a fashionable look a la The Walking Dead. High-topped, short, or everywhere in between, pick-up a black pair of combat boots before the first snowstorm. Another trend that is coming our way is mask-wearing. We’re looking at a masked future, here, gentlemen. Bunny ears, white and black half masks, and geometrically-shaped pieces of plastic will be donning your mugs at one point or another. This relatively inexpensive fashion accessory will most likely hit the metropolitan areas first, and spread to the rest of the country. What will you be sporting this winter? The key is to attempt to be playful. Be conscious of the wondrous trends hitting the stores and catwalks around you, and most of all, have fun. Speaking of ever-lasting style, Charlie Brown, the beloved cartoon character from the comic strip Peanuts, has left his mark in the fashion industry. Yes, you heard me – Charlie Brown! Charlie’s iconic canary yellow t-shirt with its bold zigzag pattern inspired several collections on the runway this fall. Metallics, lashes, lines and complexions are scorching hot during this wintry cold season. CALLING ALL MODELS! Think you've got what it takes to join our stunning team of Darpan models? Here's your last chance. Register for your audition spot today!! Are you a fashionista that loves the limelight, the glam, the paparazzi? Here's your opportunity to shine. Darpan Magazine is CALLING ALL MODELS to stomp the runway at the year's most glamourous fashion show at the Darpan Extraordinary Achievement Awards. With all the sports mania, loud slogans and logo tees are hitting mainstream runway with a storm. A handful of designers have used this time to get a few things off their chest. These very special summer makeup trends will allow women of all ages to not only be bold and explore, but actually be able to try daring makeup looks without being criticized for wearing ‘too much’ during this playful season!